THE National Green Tribunal (NGT) has ordered about 70 industrial units operating inside the “no-development zone” near Kaziranga National Park in Assam to shut down. It has also imposed a penalty of Rs 1 lakh each on the Union Ministry of Environment and Forests (MoEF) and the state for allowing the units to operate in the restricted zone. Kaziranga, a world heritage site, is home to the largest population of one-horned rhino and is known for high density of tigers. MoEF had declared an area along the eastern boundary of Kaziranga a “no-development zone” in 1996. But the state had allowed more than 100 industrial units, including stone crushers, tea factories and brick kilns, to operate in and around this zone. The units have been found to be burning large amounts of coal with high sulphur content and discharging untreated effluent in the open. This came to light in August following a petition filed in NGT last year. In its judgement on September 7, NGT noted that the units were causing air and water pollution, thereby damaging the ecology of Kaziranga. “Non-implementation of the notification, both by the Centre, and the state shows their callousness and apathy in protecting ecology of Kaziranga,” said NGT. The penalty will be used to conserve ecology and wildlife in Kaziranga and restore the zone. NGT allowed units within 500 metres of the zone to operate on the condition that they will take strict pollution control measures. “Around 33,500 tonnes of high-sulphur coal was being burnt near the reserve. I am glad that NGT has come to the rescue of Kaziranga,” says petitioner Rohit Choudhury, a conservation activist in Assam. In the mid-1990s, a petroleum refinery was set up in Numaligarh, which is about 15 km east of the park. Fearing that further industrial development in the region would disturb the ecology and wildlife of the park, MoEF had notified the no-development zone under the Environment Protection Act (EPA). 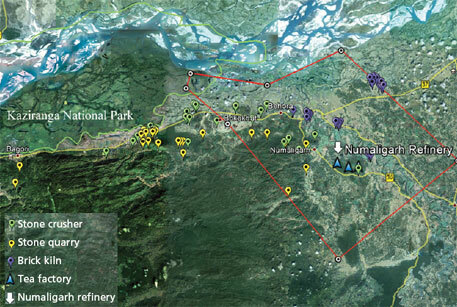 As per the notification, no industrial unit can be expanded or established within a radius of about 15 km around the refinery and up to the Kaziranga boundary without prior approval of MoEF. Ignoring this notification, 34 stone crushing units, 25 tea factories and 34 brick kilns were operational in and around the zone. In his petition, Choudhury sought directions to restrain the industrial activities. The response to RTI applications by Choudhury prior to the petition shows the state had given the go-ahead to the units. “MoEF was not even aware of the violation,” says Choudhury. Following the petition, NGT asked MoEF to inspect the area and submit a report on the status of industries operating in and around the zone. CPCB studied the region from June 28 to July 1 this year. The tribunal, meanwhile, put a temporary ban on the operations of all the stone crushers. CPCB’s report, submitted in August, shows that of the total number of stone crushers, 11 were inside the zone while the rest fell within 500 metres of it. As for the tea factories, 22 were operating inside the zone, while the rest were within 500 metres of it. The report also highlights the pollution caused by the units. In tea factories, coal is burnt to dry tea leaves. These factories produce 1,200 to 2,500 tonnes of tea per annum. In the process, they consume 1,000 to 2,500 tonnes of coal each per annum. “The tea units in and around Kaziranga use coal from Assam and Nagaland. This coal has very high sulphur content,” says CPCB. The report points out that most of the tea factories release effluent without treatment. A tea factory generates 2,000 to 10,000 litres of effluent every day. Each brick kiln burns 250-450 tonnes of coal in a year. Three kilns were operating without a fixed chimney, violating EPA. When asked why the forest department allowed the units near Kaziranga, chief wildlife warden of Assam, Suresh Chand, said, “The Centre was responsible for implementing the notification. But it did not designate anyone to monitor the implementation.” Asked why the department did not take suo moto action against the polluting units, Chand said,Ã”Ã‡Ãª“We had asked the stone crushers to obtain environmental clearance but they got a stay from the court.” The department has no control on tea factories and brick kilns. They are small units and not very close to Kaziranga, Chand said.